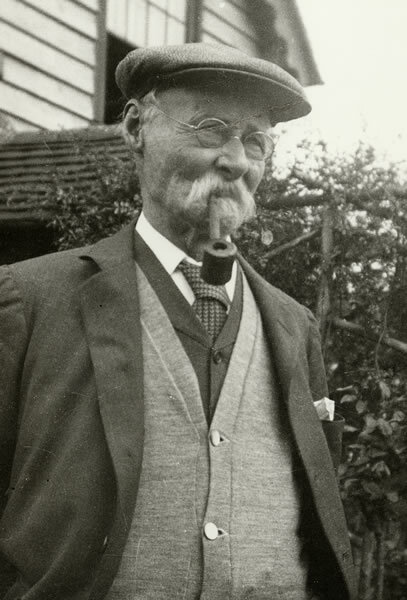 Ike Ingram was born on 14 May 1855 in Leigh and died aged 92½ at Oak Cottage, The Green, Leigh on 9 November 1947. 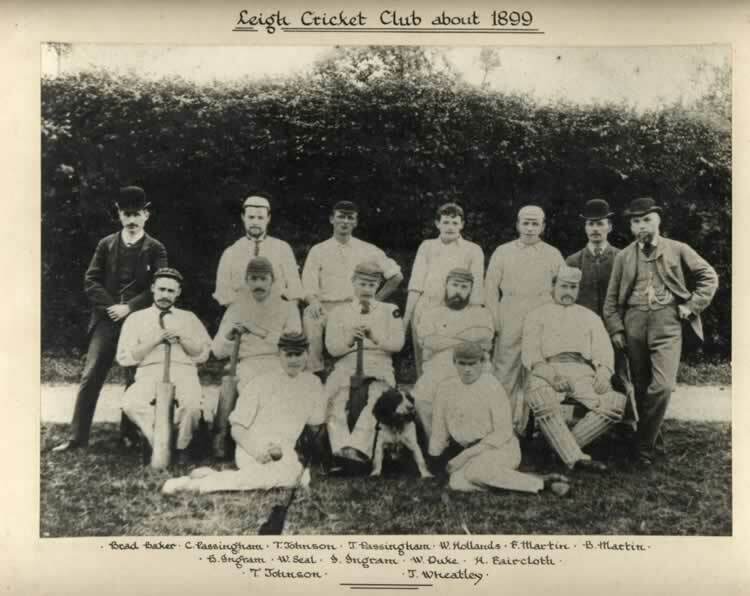 He played cricket for Leigh and for Chiddingstone Causeway and for two seasons, 1878 and 1879, when he was 23/24 he played as a professional (a “player” as opposed to a “gentleman”) for Kent as wicket keeper and lower order batsman. As far as the printed records in a Wisden publication of all county cricketers show, Ike had seven innings for Kent over the two years including one century (112 runs). Centuries were unusual in those days. His other scores were 12, 20, 1, 25, 5 and 0. However, some printed Kent score cards seem to indicate he may well have played more matches. His catching and stumping seemed competent. In all he caught 8 and stumped … in the relatively few Kent matches mentioned in Wisden. Apart from his century for the county, the other high point in his career was on 5 and 6 August 1878 when he played for “13 of Kent” against an “All England” team which included W G Grace. Ike, batting 12th out of 13 was caught. Morley bowled W G Grace for 1 in the first innings and did not have to bat in the second because Kent (294 and 79 for 1) beat the All England team convincingly (192 and 174). W G Grace was 21 and 14. Ike also played against an MCC team which featured W G Grace on 7, 8 and 9 August the following year. The overall result (again a convincing Kent win) and not very good performances by either W G or Ike, which were rather similar to the previous year (0 and 1 for W G and 0 and 0 for Ike). Ike’s status in the team is not recorded in the cricket books and it may just be the printers of the score cards who have him down as “Ingram” or “I Ingram”. However, most of the County and MCC and England teams have “Esq” after their name (part from Lord Harris and Hon. Ivo Bright and it seems likely that the three or four people in each team who do not have “Esq” after their names were the professional players, as we know Ike was, although quite clearly his wages for most of his life came from his cricket ball making at Chiddingstone Causeway. Ike played for the two local teams for many years and there are detailed score books in the Cricket Clubs. John Knock copied down the details for a fair number of the 1880-1894 Leigh games and Ike as well as two other Ingrams, W Ingram and A Ingram, featured prominently. However, it seems that Ike did not keep wicket for Leigh. Instead, he was a particularly good bowler as well as a good batsman. 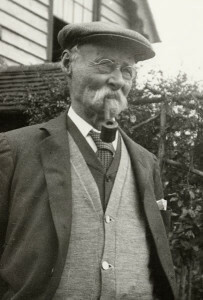 Looking at eight matches in 1880 for example against villages such as Speldhurst, Frant, Nunhead and Langton, Ike averaged 20, but in one match against a team called Lennox he took 5 wickets for 35 runs in 18 overs. In 1882, when Ike was 27, he took 4 for 37 at the Vine against Sevenoaks Town and a couple of months later 5 for 17 in 10 overs. In 1883 and 1884, as well as some good innings (145, 45, 80), he was usually taking between three and six wickets. By 1892-1894 when Ike was in his mid-thirties he does not seem to be so successful, if John Knock’s selection of score cards is typical. It does not say for how long Ike continued to play for Leigh (although the Cricket Club records almost certainly contain this information). Ike’s outstanding years for Leigh and The Causeway must have been between 1882 and 1886. The trophy in Leigh pavilion records that it was presented to Isaac Ingram for Best Average of 44 playing for Leigh in 1882 and for the best batting averages – unspecified for Chiddingstone Causeway in 1883, 1885 and 1886. Until his death, Ike received a pension of 7/6d a week from the KCC, sixty eight years after he had played for Kent, surely another record. Ike was a well-known cricket ball maker for Messrs Duke & Son in Chiddingstone Causeway. With his colleagues there, he made a set of six balls in 1882 which were sent to the Melbourne Exhibition. They won first prize. One of them was later presented to Ike to commemorate his batting success for Leigh and Chiddingstone 1882. It is this ball and trophy which was presented to Leigh Cricket Club by C V (Charles) Ingram, Ike’s son. It still lives in the Leigh pavilion. NOTE: It was Duke & Son who invented the treble seam cricket ball in 1780 which is still used today. They had make cricket balls locally perhaps as far back as 1550. See also “We Had Everything…”, various mentions of the Ingram family, in particular Mrs Doris Dale (née Ingram, Ike’s granddaughter) pp254, and Vera Dale (Ike’s granddaughter in-law) pp 258.